Port Melin beach is situated in a cove, only minutes away from the harbor of Port-Lay. Small boats are moored a few meters away from the shore. 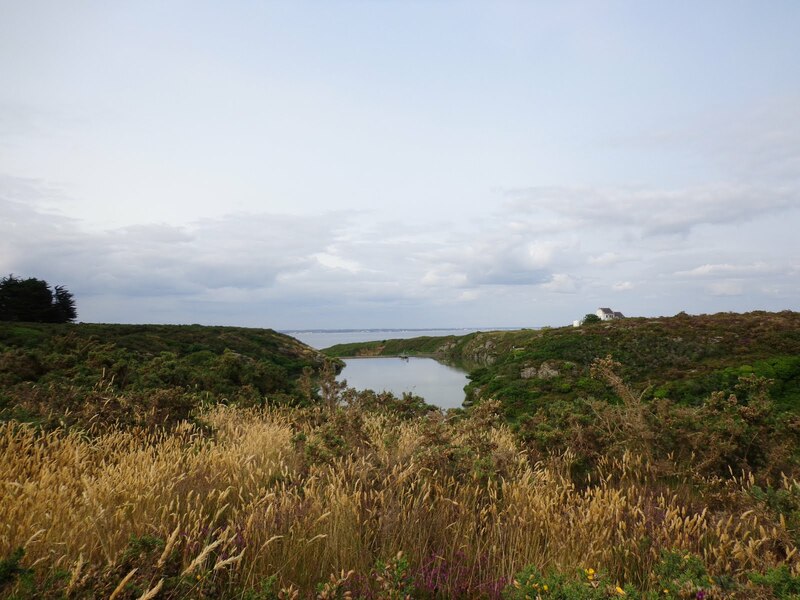 Port Melin is remarkable because it is at the foot of a dam holding the island’s main freshwater reserve. It was built in 1967, mainly by Portuguese workers who ended up settling for good on the island and for many running construction businesses. Port Melin may not be the beach with the clearest waters or the thinest sand, but it is a great place to go for a swim, especially when the tide is high. As the cove is steep-sided, surrounded by luxuriant heath, it gives an impression of swimming in a fjord ! If you like snorkeling, you will enjoy watching fish swimming among the rocks and algae. There is a flight of stairs carved in the rock on the left-hand side of the cove, when the dam is behind your back. It is used by the yachtsmen and fishermen but it’s also a great place for people who like to dive. When the tide is low, it’s also a shortcut to the water if walking on algae is not something you’re fond of. Children like to play around in the ponds, with the shiny little rocks scattered on the sand and the surrounding boulders can quickly turn into a climbing wall for the most adventurous ! The coastal path going up past the dam will lead you to one of the most beautiful coves of the island, Poulziorec. Worth a glimpse (and a swim) !